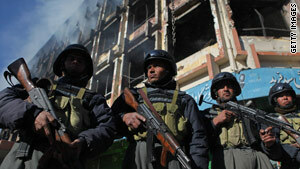 Afghan police deployed on the streets of Kabul after recent attacks by Taliban-linked militants. Kabul, Afghanistan (CNN) -- Afghanistan said Sunday it will postpone parliamentary elections from May until September. The election commission cited several reasons for its decision: security concerns, logistical challenges and a budget shortfall. "The purpose of the election is for the people to manifest their will through their votes. If they cannot do that due to issues of security, technical reasons or fraudulent practices, if the issues of fraud that marred the presidential election last year have not been removed -- then it is better to postpone the elections until such a time as these issues have been resolved," said Dauod Sultanzoy, a member of parliament. The move will likely please Western donors since the delay allows more time to put election reforms in place. Western nations have asked for such reforms to prevent a repeat of the widespread fraud that marred last year's presidential elections. The postponement gives the electoral institutions additional time to carry out the necessary preparations for the elections, the United Nations Assistance Mission in Afghanistan said in a statement. This would have been extremely difficult to do by the original date. It also provides time to make improvements to the electoral process based on lessons learned during the presidential and provincial council elections in 2009. The U.S. Embassy in Kabul also released a statement saying it respects Sunday's decision.